Once the free trial period for a premium map is over (or you want to use the map offline), you need to purchase a subscription. If you already have the map in your map list (which is usually the case unless you’re interested in a Tour & Trail map — in which case you can just tap the star icon for a list of premium maps), you can just go into the Map Manager and tap the name of the map, which will bring up the detailed map settings. 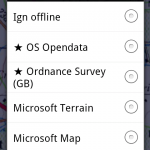 The map detail screen includes a summary of your current subscription for that map (if any). Tap the Pricing button for purchase options. There are usually several durations for online and offline maps, all of which are also described on this site. For maps for which only one option exists (Tour & Trails), the Pricing button is replaced by a Buy for … button. In the menu, tap Select Map, then the ★ button. Select the map you want to purchase. 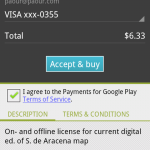 Your map has been configured; if you haven’t purchased a license yet, do so by tapping Buy or Pricing. This is where you can finalize the purchase by selecting a payment method and tapping Accept and Buy. 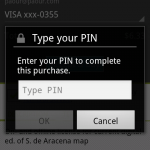 If you’ve set a PIN on Play Store, you’ll have to type it in to proceed. Some maps are designed to be used offline; for these, when the purchase is complete, you will be asked to start the offline download. If the download doesn’t complete the first time through, you can try again later by going into the Map Manager and tapping the Create offline button.